Some of the music I love the best I stumbled upon completely by chance. Nowadays there are various ways to discover new music, but, as a self-declared minimalist, I’ve discovered a method that involves using only my Twitter account and the free app TweetTheBeat by iDrew Software. 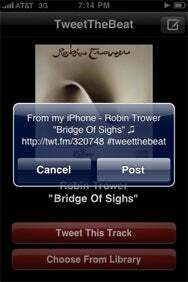 The Beat Goes On: Using TweetTheBeat, you can post information on Twitter about the track playing on your iPhone. And you can use the #tweetthebeat hashtag to find out what others are listening to. TweetTheBeat is very simple to use because it provides only two options: Tweet This Track, which generates a tweet containing info about the song that’s currently cued up in the iPod app, and From Library, which lets you browse the tracks on your device and generate a tweet from any that you choose. The app then produces a tweet containing the selected track name, artist and, most importantly, a URL. Clicking on the URL takes you to a page on twt.fm where you can listen to the entire song. (The music discovery and sharing site iMeem hosts the streaming.) The embedded music player also provides links to the track on both Amazon and iTunes. Additionally, you have the option of logging into twt.fm using your Twitter credentials, which will let you tweet back a comment about the track. The key to TweetTheBeat’s power is its inclusion of a special hashtag in your tweet. By searching on the hashtag #tweetthebeat in your Twitter client (you can also include other parameters, such an artist’s name), you can see what other TweetTheBeat users are listening to. This makes the app an interesting way to share and discover new music (and people) outside of your normal friend list. This feature has been made even more useful by Twitter’s new List functionality, which provides a way to save such search parameters. A couple of things about the app struck a chord with me. First of all, I would like to spice up my feed by adding comments to my tweets, but the app provides no way to do that. Also, unless your musical taste is very mainstream, don’t count on it getting your songs correct 100 percent of the time—or sometimes at all. For example, I tweeted the title track to Robin Trower’s new album, What Lies Beneath, but the track it selected was “Freefall.” (At least it was from the same album.) I tweeted some tracks by Rammstein and got no track links at all. To be fair, since the app relies on both twt.fm and iMeem, the fault may lie in those services, so I won’t complain too much. Lastly, if you just leave the app open as you listen to your music, the track doesn’t advance along with the music. This means that every time you want to tweet a track, you have to close the app and re-open it to pick up the currently playing song. It would be nice if TweetTheBeat would stay in sync with your music and provide at least some basic playback controls. TweetTheBeat is currently available as a free download, though its App Store page emphasize the free price is “for a limited time.” If you’re interested in the app, best to grab it now. On the surface, the app may seem a little silly and frivolous, especially if you’re not into Twitter (which, I admit, can also seem a little silly and frivolous). But for Twittering music lovers, TweetTheBeat provides an interesting way to discover new music (and promote your own) in a very free and somewhat random way. And, sometimes, the most interesting things in life are those that you simply stumble upon.